The start of the first mountain bike practice day was the awesome course at Brookvale Provincial Ski Park. The course is just over 4.3KM a ride able 50/50 mix of technical single track with lots of exposed roots and fast open double track. The features giving the athletes their greatest challenge include a technical rock section and two very steep triple down descents. The course will suit good pilots whose technical skills will allow them to gain time on athletes with similar fitness. 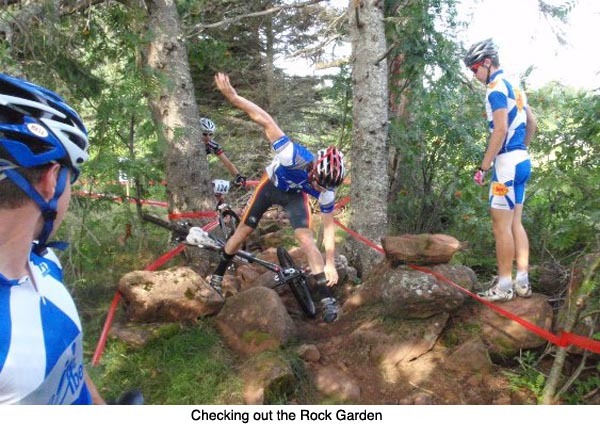 Athletes to watch in tomorrow's men's cross country mountain bike race include Raphaël Gagné from Quebec who is the 2009 under-23 National Champion and Evan Guthrie from BC, the 2009 Junior National Champion. Men start at 11:00am and women start at 2:00pm at Brookvale Park just outside of Summerside. The course is spectator friendly making it easy to cheer on the athletes. The athletes completed their first day of training with practice on the individual time trial course in Evangeline. The practice time gave coaches the opportunity to work on corner skills and for the athletes to get comfortable on their road bikes set up with aero bars. The Consensus is it will be a fast course and might suit a rider that can turn over big gear. The athletes will also have to pace themselves to have energy left for the 4km false flat to the finish line. Athletes to watch on Tuesday for the 22km men's time trial include Cody Campbell from BC who finish in 3rd place in the under 23 National Championship ITT. Mathew Bell from Ontario will also be in the hunt for a podium position. 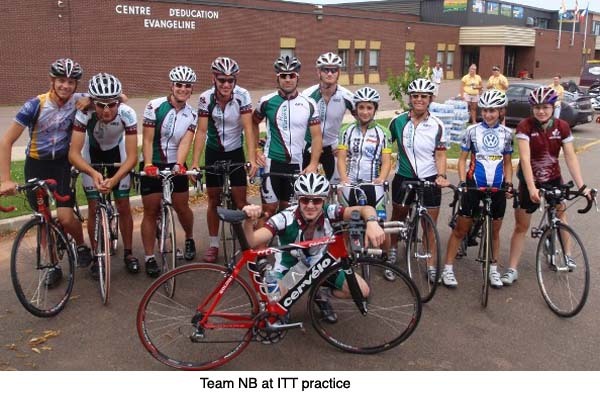 The women's 14km time trial will feature the 2009 Junior National Champion Denise Ramsden from Ontario and Julie Garnet from Saskatchewan who recently finished in 19th place in Moscow at Junior Road World's. Men start at 10:00am and women start at 1:00pm in the Evangeline area west of Summerside.